PHILADELPHIA, Penn. -- The Republican National Convention wrapped in Cleveland last week, and aside from a few awkward moments, it ran fairly smoothly. It doesn't look like the Democratic convention will be as lucky. Fireworks started even before the convention was gaveled in, amping up the stakes for this week. 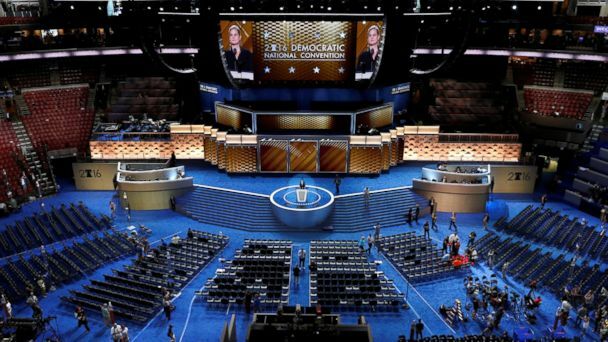 Here are the five biggest stories to keep an eye on as the Democratic National Convention starts today. The lead-up to the convention was not without its own share of drama. Debbie Wasserman Schultz announced Sunday afternoon that she will be resigning as chair of the Democratic National Committee immediately following the convention. This downgrade in her planned role comes after the leak of internal Democratic National Committee emails in which staffers were reportedly brainstorming ways to work against Sen. Bernie Sanders. Even a brief appearance by Wasserman Schultz, though, is likely to be met with widespread jeering among Sanders delegates, party officials acknowledge. While the plan to have Wasserman Schultz open and close the proceedings remains in place, she also claimed in her announcement that she will still address the convention. The Democratic convention is going to start off with a spark as Sen. Bernie Sanders is set to make his address this evening. He was Clinton's strongest competitor during the primary and only formally endorsed her on July 12, a month after it became clear that she had clinched the number of delegates necessary to secure the party's nomination. There is still a strong contingent of Sanders supporters who are upset with how the Democratic National Committee and Clinton's team handled the primary, meaning that there could be some action on the floor during his speech. One of the biggest orders of business today is supposed to be the convention's acceptance of the party rules that were settled over the weekend. The Democratic National Convention's Rules Committee passed a resolution Saturday establishing a "unity reform commission." The resolution, presented to the full committee as a compromise from the Sanders and Clinton campaigns, would establish a commission next year to review the election and the role of super delegates and caucuses. The commission will be made up of nine Clinton appointees, seven Sanders appointees and three DNC appointees. They've been tasked with making recommendations to ensure caucuses are "protected," "less burdensome" and "more transparent." Hillary Clinton may be the woman making history by becoming the first woman to be nominated for president by a major party, but there are two other women who will be center stage tonight. The first is first lady Michelle Obama, who is one of the headliners of the first night of the convention, and the second is Sen. Elizabeth Warren. Warren has campaigned with Clinton since it became clear that she secured enough delegates to clinch the nomination, and Warren was also believed to be among the final contenders to become Clinton's pick for vice president. Between Warren and Sanders, some see today as the "progressive" day of the convention, since they are both viewed as two of the most outspoken advocates for left-leaning policies. While their convention may have wrapped up in Cleveland, the Republicans are now setting their sights on Philadelphia. All told, they're expecting to spend more than $350,000 on their efforts at the DNC, a senior Republican National Committee official told ABC News. The RNC is sending about 36 staffers and about the same number of volunteers to get their message out against presumptive Democratic nominee Hillary Clinton in Philadelphia this coming week. "I think it's important for the RNC to be in Philadelphia ... so that we can have a rapid response set up," national spokeswoman Lindsay Walters told ABC. ABC News' Rick Klein and MaryAlice Parks contributed to this report.